RCSpeedo | The best RC airplane speedometer app! Turn your smartphone into an RC airplane speedometer with RCSpeedo! 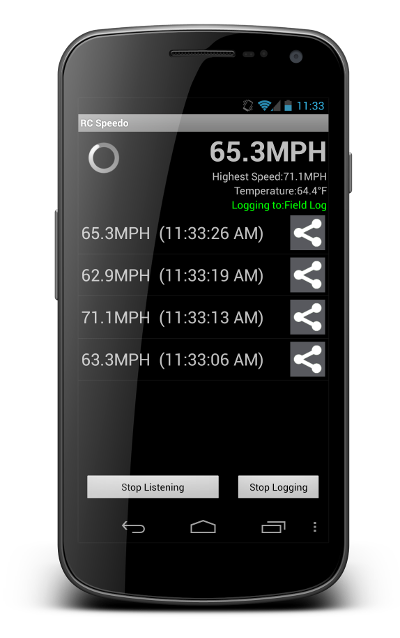 RCSpeedo can instantly upload speeds to Twitter or Facebook to share with your friends. RCSpeedo supports a variety of social applications for easy sharing. User generated logging tool allows easy to create speed databases that can be exported via Email. Exported speed data can be brought into any spreadsheet program. Great for comparing speed changes in plane upgrades! Easy to use in the field! Text and voice reporting for each pass allows you to focus on flying! Cheaper than a radar gun! Want to know more about RCSpeedo? Do you want to know more about the science behind RCSpeedo or have questions about the app? Check out our “Guides and Manuals” page by clicking the button below for more information.